According to the Southern Poverty Law Center, McInnes’ event—and the violence that was carried out afterward—had attracted individuals affiliated with the skinhead gangs 211 Bootboys and Battalion 49. BuzzFeed reported that the New York Police Department wasn’t answering questions this weekend about why none of the Proud Boys members filmed beating and kicking people were arrested, even though police arrived on the scene during the melee. New York Governor Andrew Cuomo called on the FBI and New York State Police Hate Crimes Unit to investigate the incident further. On Sunday night, NYPD said it was continuing to investigate the incident, but provided no substantial updates despite the fact that information has been plastered all over the internet. “I have a lot of support in the NYPD and I very much appreciate that,” McInnes said after the event. But now, after public outcry, NYPD said it is looking to charge nine Proud Boys filmed on Friday with assault. Meanwhile, on the West coast, Proud Boys took to streets of Portland the day after McInnes’ New York appearance and engaged in a series of similar scuffles. Earlier this year in Portland, a rally at which Proud Boys appeared grew so violent that police declared it a riot. On October 7, Proud Boys started a fight against counter-protesters at a Rhode Island “Resist Marxism” rally. What happened coast-to-coast this weekend was not atypical of the Proud Boys’ public appearances: it was part of a pattern spawning from McInnes’ lust for violence and his embrace of extremist right-wing politics. 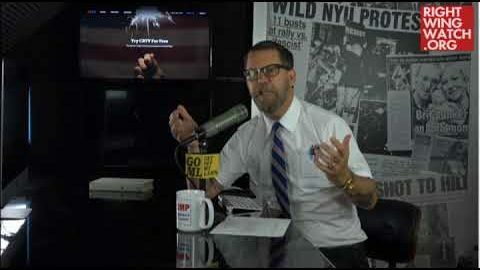 In a video montage provided to Right Wing Watch by a reader who asked to remain anonymous, McInnes can be seen broadcasting endorsements of violence to his listeners during his time at the web-based radio company Compound Media. 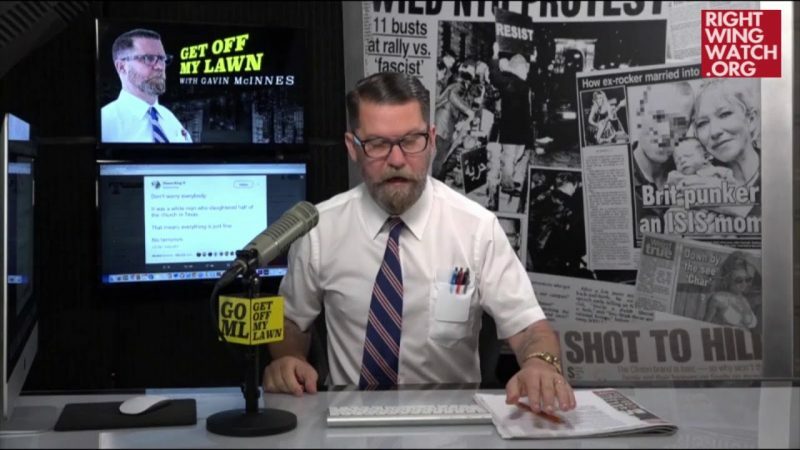 In the 15-minute video, McInnes repeatedly makes statements sanctioning violence and glorifying those who commit acts of violence against their perceived political enemies. Those commendations for violence have continued to be a staple of his show, which is now hosted at Mark Levin’s CRTV. Throughout the last two years, it’s become evident that some Proud Boys have been happy to act out this violence, for which they are celebrated. The qualifier for the highest rank of Proud Boy—known as the “Fourth Degree”—necessitates entering a physical conflict for their cause. Members of the Proud Boys have joked about wanting to shoot and kill “antifa,” the shorthand term for anti-fascist protesters. In May, a Proud Boy went to the home of a video satirist who had mocked McInnes, menacing the satirist. 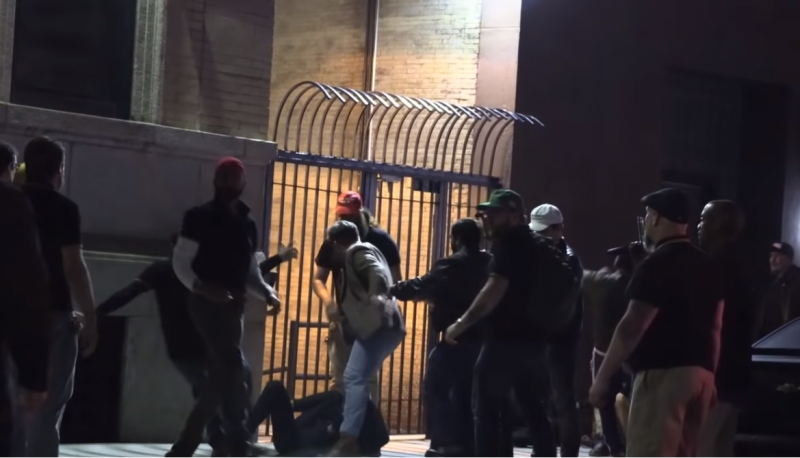 In Los Angeles, Proud Boys members got into a bar fight with members of Democratic Socialists of America. At Berkeley, the group has engaged in bloody conflicts. McInnes has also been personally implicated in a handful of violent incidents. He once took to air on CRTV with a black eye, during which bragged about assaulting a man who, he said, looked “kind of Hispanic” over an argument about dog poop. Another time, McInnes boasted about beating a Proud Boy he suspected was wearing a wire, only to find out that the suspected wire was an insulin pump. In 2017, McInnes threw fists at a protester outside a pro-Trump event in Washington. In 2016, McInnes and his group took a hat and cell phone from a man in New York, and McInnes smashed his phone on the ground. The group that shot a video of the attack described the victim as being mentally disabled. Although the Proud Boys do not state an explicit white nationalist agenda, the group frequently appears at events where white nationalist groups are present. In Portland earlier this year, we witnessed Proud Boys peppered among a crowd that included members of several extremist groups at a rally that broke into chaos. We saw a similar mix of Proud Boys and neo-Nazis in Washington, DC, at the Mother of All Rallies. In 2017, Proud Boys attended the violent “Unite the Right” rally in Charlottesville, Virginia, against the wishes of McInnes and the group has hosted a handful of young men who would pivot into unabashed white supremacy. and Augustus Invictus, a failed alt-right political candidate. Trump confidant Roger Stone often hires Proud Boys to serve as his private security force at events.